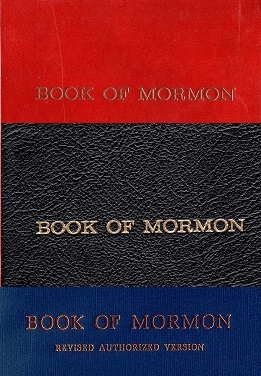 Today, there is a spectrum of belief in the church about the Book of Mormon. Affirming room for differences of belief about the Book of Mormon is a hallmark of the Reorganization and the church today. As I know some people struggle with the Book of Mormon, and its place in the church, I decided to try to write a series of blog posts about it, as I felt that it might be worthwhile to write something that seeks to help all members of the church grow more comfortable with the Book of Mormon. The Book of Mormon is one of my favourite features of Community of Christ; but I know that many people struggle with it, and so I hope that my posts will help people overcome some of their concerns with it, and hopefully be open to the merit that it may have. There are many diverse opinions among Community of Christ members regarding the nature of the Book of Mormon. Some people, like myself, regard it as both a historical and scriptural record. Others view it as scriptural, but not historical. Some would prefer that it would not be viewed as scripture, and may not be comfortable with its position in the church. Others regard it in such high esteem that if the church abandoned it, they might abandon the church. 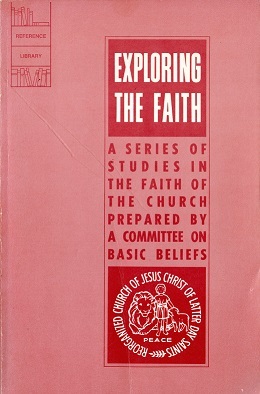 In 2009, in the Facing Our Challenges interview (part 2) conducted by Apostle Linda Booth, President Stephen Veazey stated “It seems the Book of Mormon defies any simple explanation or theory”. It seems to me, regarding the many views people have of it pertaining to its status or role, it quite clearly (and understandably), also defies consensus. Recognizing this, my intent with these posts is not to convert people to any particular view regarding the Book of Mormon’s status, but simply, as indicated above, to seek to help people be more at ease with its presence & role in our faith group — and to highlight some of its key themes and noteworthy scriptures. If you are unsure about how you feel about the Book of Mormon, or if you already fully embrace it, I hope that these posts will still be worthwhile to you. One of the things that I cherish most about Community of Christ is our belief in continuing revelation. We not only claim that this concept is one of our doctrines (and one of our enduring principles), but we also celebrate it. We practice it. Collectively. In my opinion, we are unique in this sense. Naturally, being a church that claims to have extra-Biblical revelations has resulted in us being a church that professes to have an open canon of scripture. This concept and that of continuing revelation, go hand-in-hand. I tend to think that these foundational principles derive from, and are only possible, because of the Book of Mormon. These concepts, and our heritage, as well as our present cultural identity, and, indeed, our very future, owe a great deal to the Book of Mormon. The early Restoration emerged during a time when the mere suggestion of extra-Biblical scripture, or new revelations, would most likely result in some very heated conversations (to put it mildly). Imagine living in the 1800s, and being given a few short documents purported to be revelations from God. You see, in comparison to the Book of Mormon, the revelations in the Doctrine and Covenants are brief. In isolation (without the Book of Mormon), with no prior grounding whatsoever in the concept of an open canon, I suspect that it would be very hard to accept a claim of divine revelation for such documents, as it would be difficult to accept something that would not take too much effort to write. After all, many of our revelations are short, and could in theory, with a little effort and time, be written by anyone, and if someone tried to pass one off as having a divine origin, I’m sure that I’d have a hard time being ok with that. But the Book of Mormon is an altogether different type of revelation. It’s not just a few pages long; it’s an entire book with rich detail, complexities, and more, woven throughout. Granted, not everyone who read it back in the 1800s was convinced, but it would have been something that I’m sure would be far more difficult to dismiss when compared with the much more brief revelations found in our Doctrine and Covenants. For whatever reason, many people did accept the Book of Mormon as being just what Joseph Smith Jr. claimed it to be; and therefore, accepting Joseph as a valid prophet of God, they became open to an ever expanding canon, and eventually even comfortable with new scripture and with new revelation. In my opinion, this would never have happened without the Book of Mormon. It paved the way for everything that followed, and the church has been shaped, and deeply blessed, by this willingness to embrace modern revelation. Though we may owe the Book of Mormon a debt of gratitude for it’s place in our church community, are we comfortable with it today? I feel that a significant number of our members are not; and I believe, in those nations where it would be appropriate to use it, that we really should strive to become comfortable with it, regardless of our positions on it’s status. Doing so seems to me like an ideal way of respecting it’s ongoing foundational role in our church. In our modern, educated, 21st century society, we often have sceptical views of just about everything. But as a people of faith, we know that God can bring about any work. Words of Counsel presented to the church in April 2013 state (in the 15th paragraph) “God calls whoever God calls”. Likewise, God can do whatever God desires. Whatever God wishes to do, to further God’s divine purposes, He can bring about. Therefore, we don’t need to become fidgety when dealing with the Book of Mormon. This is not to say that it must be taken as a historical work. But, I don’t think we need to persecute it either. And sadly, I feel that some people do just that. It has become the victim of a witch hunt by some of our own members, and, in my view at least, that is just plain wrong. I tend to think that all denominations have what might be termed denominational folklore. Such folklore includes those things that members have believed to be doctrinal, authoritative, scriptural, etc. but which were not truly any of those things. The Book of Mormon is itself a victim of church folklore, and therefore, where it is concerned, it is imperative that we resist, and overcome, the lure of folklore. There are many examples of church folklore regarding the Book of Mormon, but I only want to go into depth on one of them. However, before I do so, I’ll share a very brief overview of another one. Many people have indicated that they reject the Book of Mormon because of how Joseph translated it. 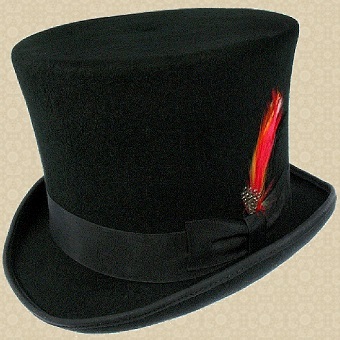 They have heard, and were shocked to learn, that Joseph put his head into a top hat, and received the words by peering into a stone at the bottom of his hat. However, that whole story properly belongs in the realm of church folklore. Joseph Smith Jr. never wrote down any such account, and the church has never, to my knowledge, expressed such a notion as the official explanation for how it was translated (in fact, I’m not sure the church has ever officially commented on that – save perhaps “by the power and authority of God”). The fact that this may have been a widely circulated story, that early church members accepted, is irrelevant, plain and simple. Another common item of folklore that people cite, as a reason to reject the Book of Mormon regards the ancestors of the Native Americans. I have conversed with many church members who say that they reject the Book of Mormon because science has proved that Native Americans are not descended from Israelites. To them, this fact demonstrates a flaw with the Book of Mormon. But it is a false flaw. The fact might be sound, but the flaw is not. Quite simply, the Book of Mormon does not claim that Native Americans were sired by the Lamanites. This is, in itself, a very interesting response. If I can make, for the sake of illustrating a point, a sweeping generalization, the membership of the church, at least in first world nations, is more or less divided into conservative and liberal members (in a church context). In my experience, if someone is going to reject or accept the Book of Mormon, liberal members are most likely to reject it and conservatives are more likely to accept it. Here is the issue that puzzles me. When conservatives resist doctrinal changes, they often quote from the scriptures. Sometimes the Book of Mormon. Sometimes the Inspired Version of the Bible, and very often, from the Doctrine and Covenants. Given that most changes that the church has considered making, pertain to principles set forth in the earliest revelations, the Doctrine and Covenants, when quoted for such purposes, is most likely being used to reference a revelation that came through the founding prophet Joseph Smith Jr. The responses that I often see or hear from liberals to such quotes, used by conservatives to resist doctrinal changes, tend to focus on the humanness of Joseph Smith Jr.
We are reminded that he was just a man. We are reminded that revelation comes through the filter of humanity, and that Joseph was no exception. We are reminded that everything must be understood in it’s proper historical and cultural context, and so forth. All of which, incidentally, is as it should be. Such notions are very appropriate, and help us to be more responsible in our efforts to follow Christ. So why is it that this same response is not applied to what Joseph said about the Book of Mormon? Why is it, that when I point out that the Book of Mormon does not teach that Native Americans are descended from the Lamanites, the response I often get is “Well that is what Joseph taught” – and leave it at that, as if that statement proves something, or is somehow authoritative? What happened to Joseph’s humanness? Why is he suddenly back on that pedestal of infallibility? Because I am conservative, I care, a great deal, about what Joseph Smith presented to the church as being derived from the mind and will of God. But, and I may be unique here, when it comes to everything else he said, everything that he spoke, or wrote down that he did not present as revelatory in nature, I don’t really care. Oh sure, from a historical interest point-of-view, I might be interested in what he said on various topics. But, beyond that, I don’t really care, because what he did not present as revelation is not accepted as revelation, and is therefore not binding on the church. It is not authoritative. We really should be extending the same courtesies to the Book of Mormon that we now extend to the rest of our scriptures. And in that area I think we sometimes stumble. We want to promote less rigid, less black-and-white, less absolute approaches to the Bible, and even to the earliest sections of the Doctrine and Covenants (and beyond), but we seem stuck about doing the same thing in regard to the Book of Mormon. In other words, just as we have done with the Bible, and the Doctrine and Covenants, and even with our history, we must separate what these things actually say from church folklore. We must extend scriptural courtesy, respect, fairness, etc., to *all* of our volumes of scripture. Another cause for concern for many of our church members regarding the Book of Mormon pertains to the fact that there are some passages or themes that are difficult to reconcile. The two that seem to be the most commonly cited (in my experience) are the death of Laban, and the curse of the Lamanites. Regarding the first example, the account of Laban’s death states that Nephi was commanded by God to slay Laban. This, quite understandably, does not sit well with many people. It does not sit well with me. We are not accustomed to God commanding people to slay other people. In fact, off the top of my head, I can’t think of another example of God giving such a commandment, with regard to one specific, named individual. In the Old Testament, God commanded warfare to take place, but how often did God ask for the death of a specific person? Actually, one example does come to mind. Isaac. God commanded Abraham to slay Isaac. Of course, God did not actually desire Isaac’s death at Abraham’s hands, and intervened to prevent it. It is possible that God’s motives in asking Nephi to slay Laban were similar to his motives in asking Abraham to slay Isaac. Of course, unlike Isaac, Laban was not spared. So, on the surface, it would seem that God did indeed desire, and commanded, Laban’s death, and if that is the case, it would take someone who is a much deeper thinker than I am to explain why that was somehow ok. But, there is another angle to consider. What do we really know from this story? We know that God sent Nephi to obtain the Plates of Brass from Laban. We know that Nephi encountered Laban, drunk, stumbling in the streets. We know Laban collapsed and we know that God then told Nephi that Laban was delivered into his hands. And we know that God then commanded Nephi to slay Laban. We also know that Nephi resisted. We know that God explained to Nephi why He commanded Nephi to slay Laban, and we know that Nephi then decapitated Laban. From all of this, it seems quite clear that God commanded Nephi to kill Laban, and that Nephi went through with it. 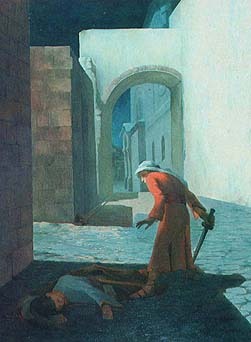 And since God did not intervene, we know that Laban was not spared, as his head was cut off. So, Nephi killed a fellow human being at the commandment of God. With regard to the story of Laban, here is what we don’t actually know. Was Laban, at the time of his beheading, still alive? We must not overlook the fact that the account states that Laban collapsed. The account was written by Nephi, according to Nephi’s own understanding of what transpired. Nephi presumed that Laban had passed out. It is my own belief that Laban in fact died. Do we know how much wine he had consumed? Do we know how strong his heart was? Do we know what ailments he may have had? God may simply have steered Nephi to Laban right when Laban died of some other cause. Perhaps Laban had a brain aneurism. We just don’t know – but, people all over the world do have unexpected episodes that often result in sudden death, all the more likely in the ancient world. God knows when it is our time. It is therefore entirely plausible that God steered Nephi to Laban at just the right moment. God then, for His purposes, asked Nephi to slay Laban, just as he asked Abraham to slay Isaac. We often presume that our scriptural heroes always pass the tests. But, just as we have come to realize that Joseph Smith Jr. was only human, we also must recognize the same to be true for Nephi. In short, it’s entirely possible that Nephi failed the test. We might wonder why God would test someone in such a way. What is to be gained? What value or merit is there to do such a thing? I have no answers to such questions – I’ll leave that as a challenge for others to consider, but the immediate absence of such answers, when the questions pertain to the purposes of God, does not warrant a rejection of the account. The story itself does not offer clues about why this test took place. This is because it was written by Nephi himself – the test subject. Nephi was unaware that he failed the test quite simply because he was oblivious to the fact that he had been tested. Nephi never knew (if my theory is correct), that Laban was already dead. God, most likely to spare Nephi guilt and turmoil, appears to have remained mute on the subject after the deed was done. The question then becomes, why was this story included? If we take the position that the authors of scripture are inspired to write what they wrote, for what purpose then does this story serve, to we who are the modern audience, removed by 26 centuries from the time and culture of the setting? Nephi thought that he knew the lesson (and for him, maybe he did), but it seems very possible that a very different lesson existed, which was not really needful for Nephi to be made aware of, but which warranted the story being preserved for the benefit of future generations. We of course can only speculate on what that lesson is, but I suspect it has, in part, the function of serving as an example of the need to look beyond the written word; to do what Nephi himself said to do – ponder the scriptures. The second stumbling block that many people have with the Book of Mormon’s actual content is the curse of the Lamanites. Many people seem to view this curse as an expression of racism. This is actually not at all the case. When we read scripture, its important to not have “knee jerk” reactions. We need to ensure, just as we are told to do when reading the Bible, that we place, whatever we read, into the proper context. Speaking of the Bible, one of the individuals mentioned in it from time to time is the adversary of God. There are even verses here and there that record his words. Knowing this, do we regard the Bible as being about the adversary? If we read just those verses, we might. This illustrates the need to explore and (again) as Nephi counselled ponder the scriptures. What do we actually know about the curse of the Lamanites? Well, we know that the reason for the curse was because they rebelled against God. It seems that God wanted to keep these rebellious individuals from influencing those who had not rebelled. Therefore, he wanted to encourage the Nephites to avoid the Lamanites. And so, to help make that more feasible, he “cursed” the Lamanites, by putting a mark on them, so that the Nephites would easily recognize the Lamanites. That mark took the form of a different complexion. As readers of the Book of Mormon today, some of us seem to have the knee jerk reaction of “that is racist!”. But, it is important to understand several things. First, the Lamanites were not transformed into some other race or ethnicity. The Book of Mormon does not say that God transformed them into aboriginal Australians. Or Africans. It does not link the curse to any ethnicity whatsoever. In short, they remained Israelites. Second, we don’t actually know what the different complexion looked like. We have no reason to believe that they were given the appearance of any other racial group. Third, the purpose of the curse was a punishment for rebelliousness. The Lamanites were not rebellious because of the curse. They were cursed because of their rebelliousness. There is no basis to think that the curse is somehow a comment on other races. Fourth, the Book of Mormon does not condone viewing the Lamanites, or anyone, with contempt. In fact, it counsels people not to do so. It is also worth noting that the mark was meaningless to God (beyond being a mark). I’m sure he used this mark of an alternate complexion because of how blatantly obvious it would be to the Nephites. But this is the only basis for that mark that we know of. Aside from the merit of being able to instantly know, by virtue of complexion, who was cursed and who was not, there does not seem to be any reason for the mark to take the form that it did. In fact, we read later on about a group of Nephites who eventually decided to rebel. They too were cursed, and they too were marked (in fulfillment of an earlier prophecy). These individuals set themselves apart by putting a dab of paint on their foreheads. So, they marked themselves. But the scriptures inform us that God viewed this self-marking as fulfillment of his warning that anyone who rebelled would be marked. So, God accepted the self-inflicted mark as a manifestation of the Lamanite curse. This then demonstrates that the actual nature of the curse’s manifestation to God was irrelevant (save of course in how it would serve his purposes). God does not view people of any particular complexion with disfavour. Doubtless, there are other passages in the Book of Mormon that trouble people. But the point of this exploration on the death of Laban and the Curse of the Lamanites is to help encourage people to recognize that these problematic scriptures need not be the roadblocks that we may otherwise feel that they are. Likewise, we need to be mindful of the fact that the Bible has many (in my opinion, far more) examples of passages that are highly troublesome, and often far more difficult (if not impossible), to reconcile with the living model of Jesus Christ. How does the church view the Book of Mormon? Does it consider it to be historical? Does it matter? I tend to believe that all that truly matters, on this point, is what you believe. The church definitely gives total freedom to all members to believe what they wish on this point. We are not required to believe that the Book of Mormon is historical. However, we are also not forced, or even prodded, towards rejecting it as historical. The church does not, at least in this era, offer an official position on the historicity of the Book of Mormon. And that is fine. But it has occurred to me that there may be some people who have a need for the church to view the Book of Mormon as historical. I’m not sure why this would be, as I don’t feel that we should have any such need. I don’t. I’d be concerned if the church had a requirement to reject it, but, though I believe that the Book of Mormon really is an account of an ancient people, I don’t require the church to officially sanction that perspective. But, if you do, truly, in your heart, have some sort of need, for the church to view it as historical, then you can just simply have that opinion. In other words, if you want the church to view the Book of Mormon as historical, just make the decision that it does. You won’t be able to quote anything that clearly and cleanly states that we regard it as such. Nor will you be able to claim that such a viewpoint is official. Nevertheless, there are some things that the church has stated (and which are official), that you are totally free to interpret, if you so wish, as indicators that the Book of Mormon is regarded by the church as historical. Understanding the above, we could conclude, if we so wished, that the church does view the Book of Mormon as true, because writing inspired by God’s spirit, providing divine guidance, cannot be based on a grand deception, an outright and massive lie. How can a mass lie point to Christ? Can the Living Word be rooted in a mass deception? Can God’s revelation take the form of a mass deception? Christ is not regarded by the church as a charlatan or mass deceiver. Inspired writings are not given to spread a mass deception. God’s revelation does not take the form of a deliberate falsification of a cultural history. Inspired to pull the wool over our eyes? A lie is the path to darkness, and a falsehood – how can such things be a witness of God’s eternal light and, especially, His eternal truth? The Holy Spirit does not reveal or inspire people to concoct a mass fantasy, passing it off as truth. A lie does not point to the true will of God. If we can set aside or even undo the concerns that we bring to our exploration of the Book of Mormon, concerning the folklore and sticky passages, etc., we might then be able to more readily consider some of the great stories, themes, and powerful passages contained within it. Naturally, what constitutes a “scriptural gem” is a matter of personal opinion. However, I’m excited to share some of the ones that I’m fond of. To begin with, I want to share a few words regarding some Book of Mormon themes. There are some great themes that run throughout the Book of Mormon. One of these themes is that of community building. I intend to talk more about that elsewhere, so I don’t want to elaborate on that at this time — but mull it over. Another theme is that of the dangers of pride. All through the Book of Mormon there are warnings to beware pride, and the hardships that result when society gives into pride. This is something I noticed the first time I read the Book of Mormon, and it stands out, as many people have observed it’s presence. Pride set in among the Nephites beginning with their second king. From that time, the Nephites fluctuated between pride and righteousness throughout their history. A period of righteousness brought prosperity. Prosperity led to pride, pride led to dissension, dissension led to desertion, desertion led to war, war led to grief, grief led to repentance, repentance led to righteousness, and righteousness led to prosperity; thus the cycle began again. Some of my favourite passages from the Book of Mormon include the story of the Vision of Lehi (and Neph’s interpretation of it). There is something intriguing about the love of God, word of God, etc. etc. being represented by the rod of iron, the tree of life, and so forth. Tangent: I sometimes chat with an LDS member. He often boasts that his church must be the true church because of how large it is. Whenever he (or any Mormon for that matter) does so, I caution them not to be too caught up on that fact. After all, in Lehi’s vision, the great and spacious building represented the pride of the world. 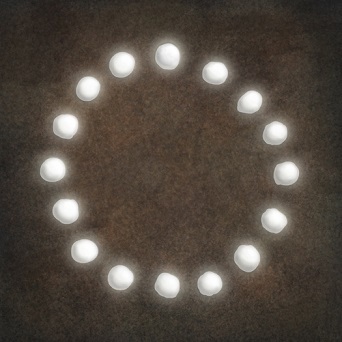 I also have always enjoyed the story of the glowing stones that God provided in order for the Jaredites to have light in their eight barges as they sailed across the ocean. Its just a neat story that reminds me of the fun Old Testament stories we learn about in as kids in Sunday school. I guess that is one of the things I really admire about the Book of Mormon. It has, like the Old Testament, some “epic” stories, which are sort of lacking in the New Testament, yet, like the latter, it has a great deal of the pastoral wisdom & compassion focused ministry that is not as abundant in the Old Testament. Finally, I’d like to end this blog by sharing what may be my favourite Book of Mormon verse of all. It is in fact, in my own opinion at least, nothing less than the long sought after meaning of life itself; and it is so short, so concise, and so simple, which only makes it seem that much more significant in my mind and heart, and it is something that I encourage all of us to remember. I’ve always been very fond of our three volumes of scripture. For that reason, I have often wondered if each has a distinct theme, intent, or purpose. Beyond the obvious. After all, we can clearly see that the Bible introduces us to the person whose church we belong to. The Book of Mormon is said to have, at least as part of it’s purpose, the function of helping to clarify the Bible. And clearly, the Doctrine and Covenants provides a lot of instruction on administrative issues; and it also provides modern guidance. But is there any other role that each has? I finally have come to realize that indeed, there is. And this realization dawned on me as I noted some common ground in some things that a few of the pastors in my area have been talking about. About once every month or so, I participate in a meeting of all the CofC pastors in my area. And I’ve noticed that one of them keeps talking about communities. Church communities. Building sacred communities. And I’ve also noticed that another keeps talking about relationships. The importance of, and basic need to form real, meaningful relationships with people. Now, as I heard both of them talk about these things, which occurred on different occasions, and not at the same time, I heard them, as is so often the case, in isolation. But one day, I was thinking about a concept that I’ve been talking about a great deal this year, in my congregation: invitation. The ministry and blessing of invitation. And then the Holy Spirit brought it all together. I suddenly recalled what my fellow pastors had mentioned, often just in passing, so many times at our meetings. And I realized that the three things that we have each been talking about, form a three fold model. They go together. Invitation will of course lead to relationships being formed. Relationships, as they develop and multiply, will ensure that community building takes place. And as the community grows, the more potential there will be to have things to invite people to. And this is when I realized, that these three concepts, invitation, relationships, and community building, form the backbones of our three volumes of scripture. You see, at the heart of the Holy Bible, is God’s invitation. When we consider the Gospels, and the rest of the New Testament, it is quite clear that the entire second half of the Bible is all about invitation: To follow Jesus Christ. That is the continual theme throughout the entire New Testament: invitation. But it’s mirrored in the Old Testament. In that record we see God is inviting people to be civil, to be people of faith, and to be responsible. The New Testament, by inviting us to follow God through Christ, invites us to be people of charity, faith, and peace. So, the entire Bible can be summed up as God’s invitation. The Doctrine and Covenants, perhaps more clearly seen in the 160s, but scattered throughout all the Sections, has ample passages that focus on how we respond to each other. The Doctrine and Covenants is all about establishing relationships. The Book of Mormon is, from start to finish, a testimony of community building. That is what the Book of Mormon is all about. Community! Community building. Quite literally! That is almost all that the Nephites did. They established spiritual gatherings, and they physically built camps, villages, towns and cities. And the spiritual gatherings and the domestic settlements were generally one-and-the same: they built Zionic communities. And they did so over and over. They were continually assaulted with hardships, trials, tribulations, internal corruption, descent and all manner of setbacks. But, somehow, they kept moving forward. The church has no greater scriptural example of community building than the Book of Mormon. No greater focus on relationships, than the Doctrine and Covenants. No greater invitation than what is found in the Holy Bible (and of course, there is some overlap). As these three themes are so prominent in our three volumes of scripture, they *must* be modeled in our discipleship. Our covenants with Jesus Christ must be founded on these concepts.